Creamfields has long been touted as one of the UK’s best dance festivals. This year, the legendary event upped the ante by expanding to four days and introducing a colossal 20,000 person super structure. 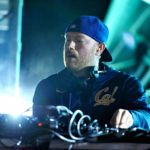 On Friday night, Eric Prydz performed from the new stage under his coveted techno moniker, Cirez D. As expected, fanfare in the wake of the performance is through the roof. One particular fan’s video from the set is making the rounds on Twitter, showcasing a grandiose interlude from Prydz to a backdrop of some seriously killer visuals. The video, though brief, offers a tantalizing taste of the performance — which, thankfully for the rest of us, will air next week as an official Cirez D Essential Mix. On Sunday night, Prydz will headline his venerated Pryda stage alongside Adam Beyer, Sasha, Alan Fitzpatrick and more.